Some time ago we had lunch at a Japanese restaurant off Leicester Square and enjoyed Nasu Dengaku, a simple dish made with aubergine halved and baked with miso paste and always one of our favourite sides. Not impressed with the price though we discovered how easy it was to make at home for a fraction of the cost. ( See the post dated 15th July 2013 ). Fast forward to last week when we were searching about for some new ideas for a birthday buffet we were cooking for a very good client in Wimbledon. We decided to transfer the idea to salmon fillets with great effect. It went down so well at that event we decided to share it with you. The photo we show is the party version - four kilos of salmon made 25 portions. We have adapted the recipe for the more usual dinner party. Mix all the above ( except salmon) and pour over the salmon for approximately half an hour before cooking. Cover and leave in the fridge. Bake in a pre-heated oven (180 C) for about 15 minutes then caramelise under the grill for a further 2 to 3 minutes. 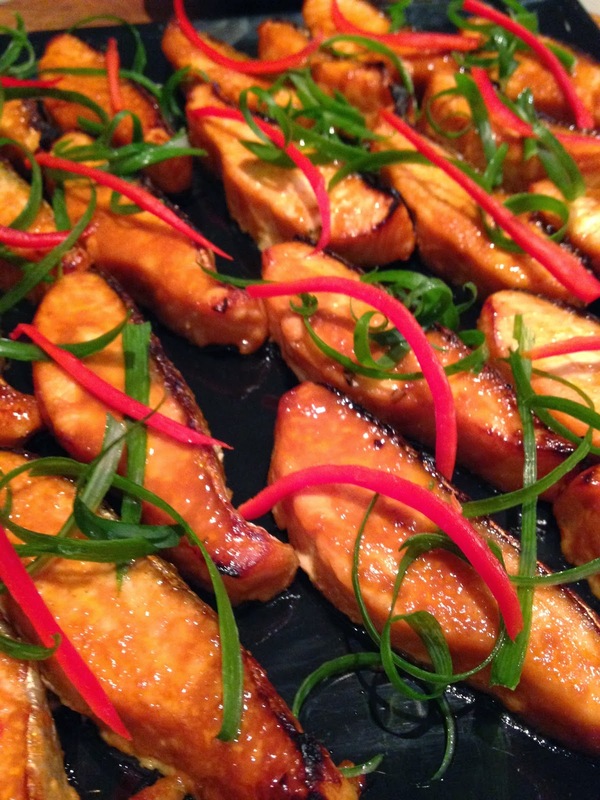 Ideally garnish it with chilli and spring onion and serve with rice or noodles and cucumber salad.